A scientist performs illegal experiments with human and rabbit genetic material under the thinly veiled guise of IVF research with surprising results. 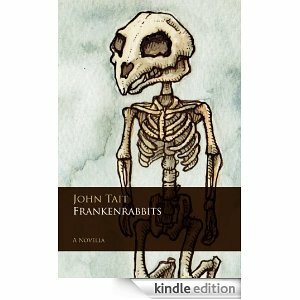 Set against the backdrop of a downbeat London in the midst of a recession John Tait's interesting tale of the Frankenrabbits or "mixies" is a fascinating read. As the structure of London’s society starts to change the main characters life starts to fall apart. The title is, perhaps arguably, a little misleading. I wouldn't consider this a horror tale and I suspect neither does John. It came across very well indeed as a social commentary. John's insights into what might happen if a hybrid race were to be integrated into our society were both thoughtful and in depth. An interesting, enjoyable and very thoughtful dark tale with flashes of humour. There may be a moral message about our meddling science within the story but the author doesn't put it across in a preachy way. I liked that about it. John turned what could easily have been a quite daft suspension of disbelief into a thought provoking tale that asks WHAT IF? In bold letters. If you fancy a break from anything that is set within a specific genre you could do a lot worse than download Frankenrabbits.